Get ready for the weekend with an eccentric blend of international sounds and authentic Indian rhythms. 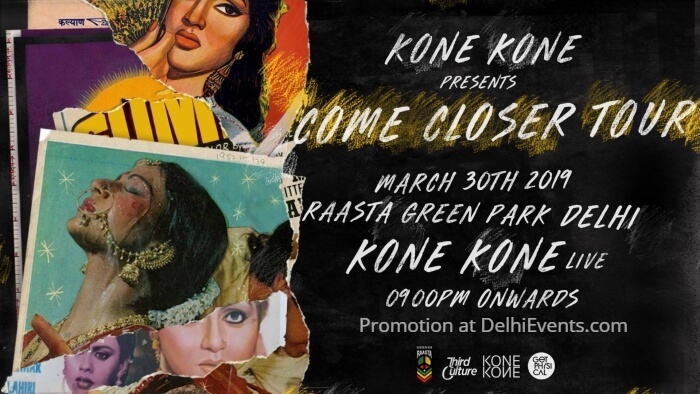 Kone Kone is all set to present their debut tour titled ‘Come Closer’. Kone Kone, produces electronic music that draws upon South Asia’s great repertoires of popular culture from 1933-2000. They are an anonymous audio-visual artists and skilled turntablists whose 90- minute set flows through genres ranging from boom bap, breakfast, house, juke, footwork, jungle and more. Their debut single, ‘Come closer’, was recently signed by Berlin-based label ‘Get Physical Music’. As of now they have been releasing a series of weekly AV remixes titled ‘ Chitrahaar’, garnering over 180K+ views on YouTube and multiple features on European radio – specifically the BBC Asian Network and sound of Berlin.